"I went to the Powder Keg Festival on Sunday afternoon. I thought the festival was a really good idea. It was fun and it seemed to be really popular. There were A LOT of people there both days and everybody loved the ice maze. 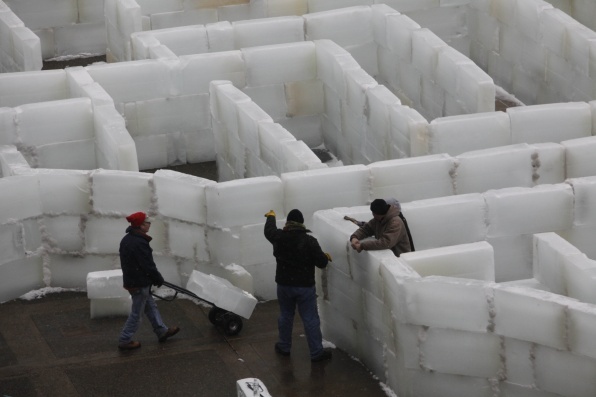 You probably already know this, but it got the World Record for biggest ice maze! It's hard to tell from the pictures but the center of the maze is shaped into a buffalo, and the arms of the throne are buffaloes too :). There was also a stage showcasing local bands, a beer and hot-dog tent, and competitions you could sign up for (broomball, snow scultpture, snowman, and igloo building contests). Other events included a "K9 Walk", Buffalo historical hike, tubing down the skyway ramp, and a showcasing of local artisans on the second and third floor of the Pearl Street Grille. There's a website you can check if you want to know more. It has a picture of the maze from above, too. It's powderkegfestival.com. Buffalo always gets a bad rap for being a run down city with nothing to do, but this festival and ice maze helped rally everyone together, gave Buffalo something to be proud of, and celebrated what we're known for: snow. Besides that, it was really fun, too." Snow tubing down the Skyway Ramp? How cool is that! This event takes place every year in February. I had no idea it got the world record but I'm very impressed! 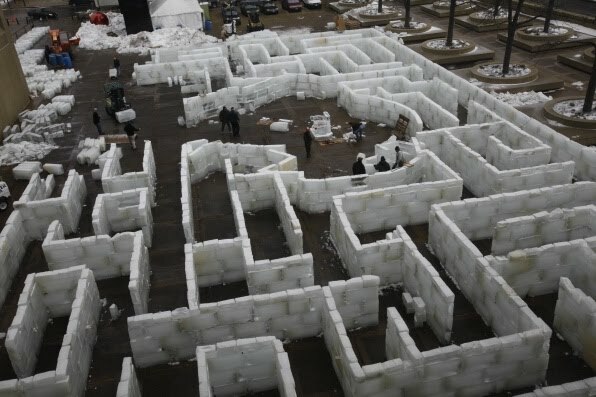 Measuring 12,855.68 square feet, the 2010 Powder Keg Festival Maze is the new Guinness World Record maze. Record aside the sheer effort it must have taken to build the maze is really impressive. Some people will do anything for free beer. I think it would be a blast to attend this event! Right after which I'd run into the Pearl Street Grill and Brewery to thaw! The brewery is worth mentioning because they are an event sponsor and because it's one of the only two Breweries left in Buffalo that still brews its own beer. Yes, it's true, my husband has me hooked on microbreweries so I couldn't leave the brewery out. He'd definitely skip the maze and wait for me in the bar. You've got to love some of their beer names: Trainwreck and Street Brawler Stout. In the mid 1800's this was a very rough area. According to the brewery during its (the Buffalo Erie Canal District's) hayday it was affectionately called "The most evil square mile in America" and it was estimated that 70-80% of the entire nation's crime occurred along the "Canawl". That too is impressive. Thankfully though, it's no longer the case. If you live in the Buffalo area or are just visiting your frozen relatives this is an event sure to cure cabin fever!